NOFX (pronounced no-ef-ex) is an American punk rock band from San Francisco, California, formed in 1983 in Los Angeles. 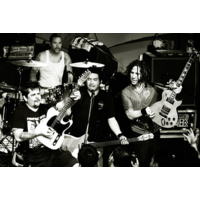 The band was formed by vocalist and bassist Fat Mike and guitarist Eric Melvin. Drummer Erik Sandin joined them shortly afterward. In 1991 El Hefe joined to play lead guitar and trumpet, rounding out the current line-up. The band rose to popularity in 1994 with their album Punk in Drublic which was certified gold, and is now considered a classic punk album by fans and critics alike. NOFX has released 11 studio albums, 15 EPs and a number of 7" singles. The group has sold over 6 million records worldwide, making them one of the most successful independent acts of all time. The band also aired their own show on Fuse TV entitled NOFX: Backstage Passport.